Motorola has definitely been inconsistent at best in terms of product quality of their Android-powered smartphones. For every great cellphone that comes out of the handset manufacturer , an even worse one is pushed to market. 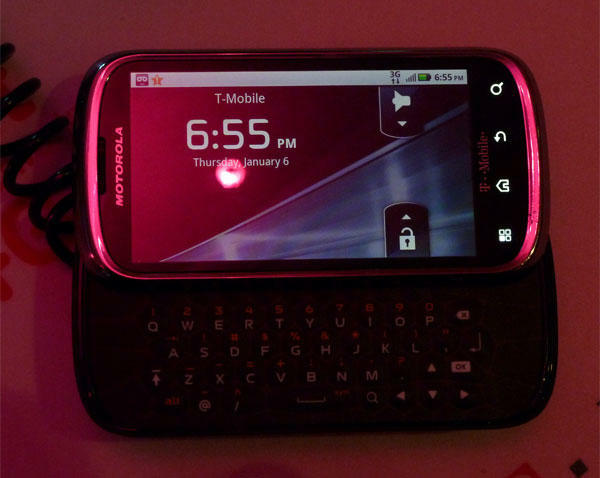 The original Motorola CLIQ was the epitome of how clunky, slow, and downright ugly an open operating system could become. Despite the criticism for the now-antiquated cellphone, Motorola has decided to give the brand another shot, introducing an odd-looking s device targeted at casual social network users. 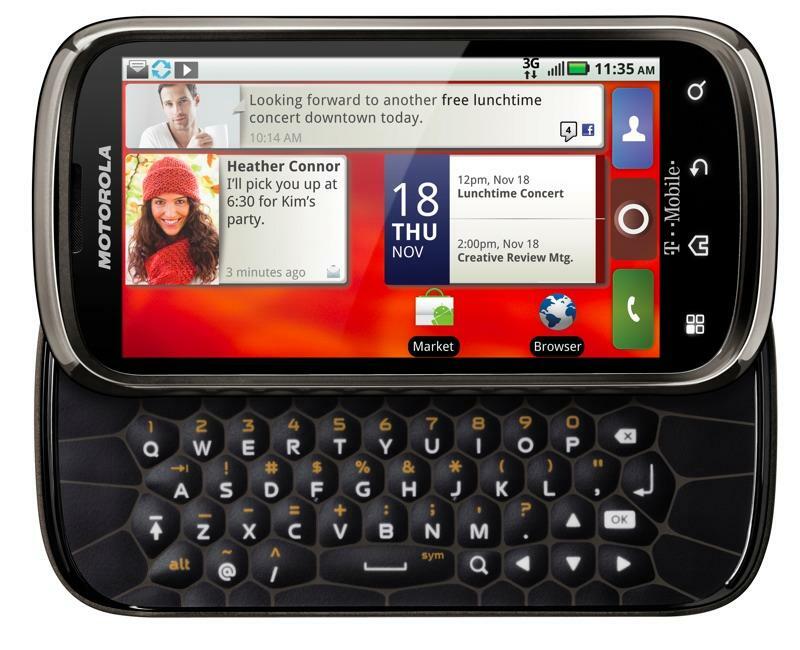 Slated for a January 19th release on T-Mobile, the Cliq 2 is set to give MOTOBLUR another chance. The vast majority of critics believed that the original system brought down the phone’s speed significantly. Luckily, this handset features a 1 GHz processor, meaning that if the graphics-heavy skin pulls down the phone’s processing power it will most likely not come at the detriment of the user. The device will be powered by Android 2.2, also known as Froyo. The most notable change from the device’s ancestor is the keyboard, which is now in an awkward-looking honeycomb pattern. Motorola claims that the shortened distance between keys will help users type faster, but those with big thumbs will most certainly be disappointed. The well-known handset manufacturer does seem rather confused with this device, not choosing a specific target audience – business or casual. Instead, Motorola executives decided to create a hybrid system that will tailor to a predominantly young demographic of businesspeople that are addicted to social networking. Is Motorola narrowing its target demographic too much? Probably not, considering that other Android-powered smartphones made by the company will be able to fill the gaps. What do you think? Will the CLIQ 2 be more successful that its predecessor? Does this device look like something that you could use on a daily basis? Let us know in the comments below. LAS VEGAS – CES – Jan. 5, 2011 — Motorola Mobility, Inc., (NYSE: MMI), and T-Mobile USA today announced the upcoming availability of Motorola CLIQ 2™ with MOTOBLUR™, a 3.7-inch touch-screen smartphone with a slide-out keypad that allows users to play hard and work hard. CLIQ 2 is the latest example of the powerful devices you can expect from Motorola that combine Android™ software and MOTOBLUR social connectivity, with the addition of new business-ready functionality. CLIQ 2 is a 3G smartphone that benefits from faster speeds at no additional cost on the T-Mobile 4G network. * Paired with an ultra-fast 1GHz processor, CLIQ 2 is designed to keep up with the busiest careers and social lives. An intelligently designed slide-out keypad shortens the distance between keys and increases key size for fast text entry. Wi-Fi calling capabilities enable users to make calls over work or home wireless networks. CLIQ 2 helps users stay connected to their home, work and weekend lives. In addition, it helps manage them with three sets of customizable home screens that provide access to the applications, shortcuts and widgets they want, when they need them. Powered by Android 2.2, users will experience rich web content with Adobe® Flash® Player. Combined with easy access to more than 100,000 applications and games from Android Market™, the latest movie hits from the pre-loaded BLOCKBUSTER® ONDEMAND application, and favorite reads via the pre-loaded Amazon Kindle application, users can turn CLIQ 2 into an entertainment hub. CLIQ 2’s high-resolution 3.7–inch touch-screen display stretches from edge-to-edge to maximize media playback and web browsing. Share media on an even larger screen, as CLIQ 2 is DLNA-enabled, allowing users to stream and share content on other DLNA-enabled devices. In addition, customers can easily frame the moments captured on CLIQ 2 with the Print to Retail feature, which allows copies to be made at a local photo retailer. For busy professionals, CLIQ 2 offers serious business functionality. Stay on time with robust calendar capabilities, which include the ability to propose new meeting times, reply and reply-all to groups, forward meeting notices and even check meeting participant availability. Stay connected with co-workers through the corporate directory, or network after hours by importing LinkedIn connections into the contact list. Users can work remotely on CLIQ 2 using Quickoffice® to view and edit important documents right on their phones. Even connect a laptop or other device to the Internet using CLIQ 2 as a 3G mobile hotspot or through Wi-Fi Sharing. Plus, IT departments will rest easy with advanced security features like remote locate and SD card wipe. Additional security features such as device and SD card encryption are expected to be available in early 2011. CLIQ 2 also provides a helping hand with communication overload. MOTOBLUR helps manage email and social networking services right from the home screen without separately accessing Facebook® and Twitter®, among others. And, time won’t be wasted because customizable filters allow consumers to control the types of messages and updates displayed in their home-screen widgets.